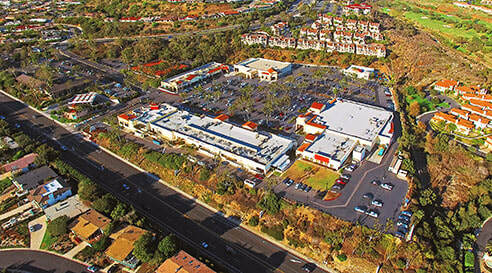 Information about Monarch Bay Plaza shopping center in Dana Point, CA. Monarch Bay Plaza has a long history of service to the local communities of Monarch Beach, Dana Point, and Laguna Niguel dating back to the early 1960s when it became Dana Point's FIRST shopping center. When Rancho Niguel, one of the original Spanish land grants of the 1800's, was purchased for residential development in the 1960s, Monarch Bay Plaza was built to serve the residents of the nearby communities. Since that time, Monarch Bay Plaza has been a major shopping destination for local residents and visitors alike, providing a wide array of merchandise ranging from daily household necessities to luxury goods and business services. As the Monarch Beach communities and Dana Point area have grown, Monarch Bay Plaza now finds itself surrounded by the championship Monarch Beach Golf Course and two of Califorhnia's finest world-class resort hotel and convention complexes – the Ritz Carlton and the Monarch Beach Resort. Visitors from around the world come to this romantic destination getaway, and Monarch Bay Plaza is still leading shopping complex offering fine dining and a variety of treasures in its specialty shops.